Many people today would list many different things as being man’s dilemma, such things as: health problems, unemployment, poverty, crime, war, and so on. Each of course are problems found in every society, excluding none. One could say man’s dilemma is universal and they would be correct. However each of the things listed above are actually the result of man’s dilemma not the cause. The cause in found in man’s depravity. In that depravity every un-regenerated human beings sets his own standard as to his or her conduct of life. Man has rejected the absolute standard of his creator and as a result is alienated toward not only God but from one another. 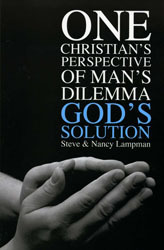 Man has no solution for this and therein lays the dilemma, God’s solution from twelve different perspectives. Each chapter is a study in itself but fits nicely as one completed work. The reader will find that because this work is a compilation of twelve smaller works many passages have been repeated in the various chapters. The writer found this approach necessary to support the message of the topic of each individual chapter. May God bless His word to the readers under-standing as he or she meditates on it. This work is in a digital format and can be downloaded to any ebook reading device; such as your PC, Laptop, or Kindle.